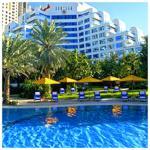 Discover all that Dubai has to offer with Sheraton Jumeira Beach Resort And Towers as a base. All 255 rooms at the hotel are well-appointed with necessary amenities to ensure that each guest's satisfaction. With elegant facilities and hospitality guests at this hotel will surely have an impressive stay. To proceed with your booking at the Sheraton Jumeira Beach Resort And Towers simply choose your travel dates and fill in our secure online booking form.